Published: Nov. 21, 2012 at 11:15 a.m. 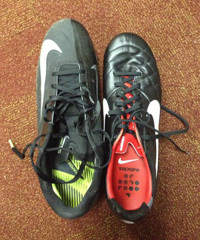 Updated: Nov. 21, 2012 at 11:56 a.m.
Washington Redskins kicker Kai Forbath has a shoe size of 10.5. Normal. However, he kicks field goals with a 7.5-sized soccer cleat. Painful. "I go through a little process with it," Forbath told Sports Evolution Radio, via The Washington Post. "We have this shoe oven. I think it's initially made for hockey skates. You put the shoe in the oven for about 10 minutes, take it out, put it on real quick while it's still burning hot. "It's horrible. I shave the inside cleats off, so my foot is slanted as I walk on it, too. When I look down, I still can't believe how it fits in there." After looking at the picture to the right courtesy of DC Sports Bog, we can't believe it fits either.